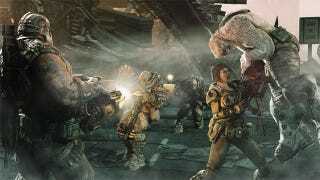 The talent behind Gears of War 3 is talking about the forthcoming game during the game's annual presence at San Diego Comic-Con. Design director Cliff Bleszinski and executive producer Rod Fergusson will be fielding questions from fans. What will they say? Let's follow along in the liveblog below to see what surprises they have in store—if any—for the Xbox 360 game due this fall.